RSPCA’s stray cat centre in Southall look after and re-home hundreds of moggies that have been abandoned every year in London. 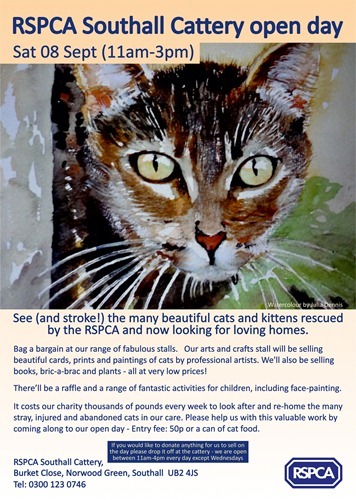 On 08 Sept they are holding a fair and open day which will include a stall selling feline art, cards, prints and paintings by a number or professional artists. All the money raised from selling the pictures will be used to fund the work of the cattery. There’ll be other stalls and activities for kids too, so why not go along and support their work with cats. If members who live in the area have anything they’d like to donate do call in to the centre.